Bally Pin (later called Astrocade Pinball) is the main game for Round 7 of the Astrocade High Score Club. I'll be out of town when a two-week round would normally end, so this round will last an extra week. It's either that, or make the round a week shorter (which I don't want to do). For this reason, Round 7 will last three weeks. The round ends on Sunday, May 22'nd at 8pm MST. "It has everything except a slot to collect your quarters! Thumper bumpers! Kicker targets! Drop targets! Realistic flipper action! They'll even catch the ball and roll it back and forth to give you the direction you want! Two different playing fields create the impression of having two pinball machines in one. Up to 4 players." 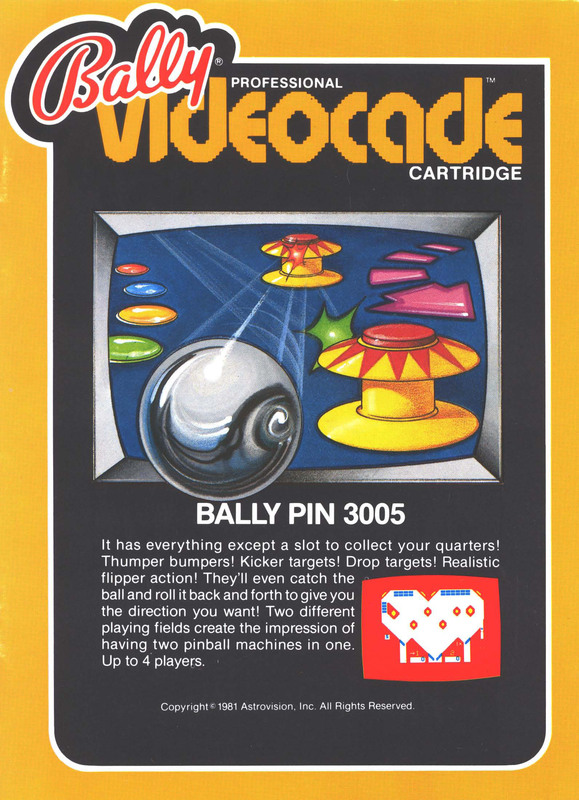 I refer to this game as Bally Pin (since the game's name was not renamed on the re-released Astrocade Pinball). 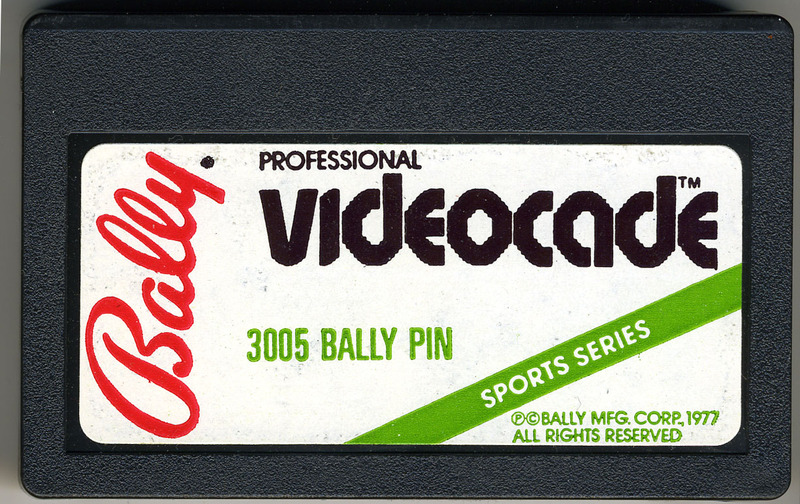 Bally Pin is a 4K game, originally released in 1979, by Bally. This game was programmed by Bob Ogden and Scot L. Norris (who provided sound effects, as he did for many of Bally's game cartridges). One hint: when I played Bally Pin under emulation, I setup the left and right Shift keys to be the flippers (I had to turn off "Sticky keys" under Windows, as it activates if you press shift five times in a row). Here is a video review of "Bally Pin" by "Nice and Games:"
"Bally Pin (Astrovision/3005) waited in limbo for some time before seeing the light of day. Its year or more of obscurity proved undeserved. This is absolutely the best video-game pinball simulation ever offered for any programmable home system. It clearly shows Bally's expertise in the pinball area. It had to be first class all the way to maintain Bally's reputation, and is. 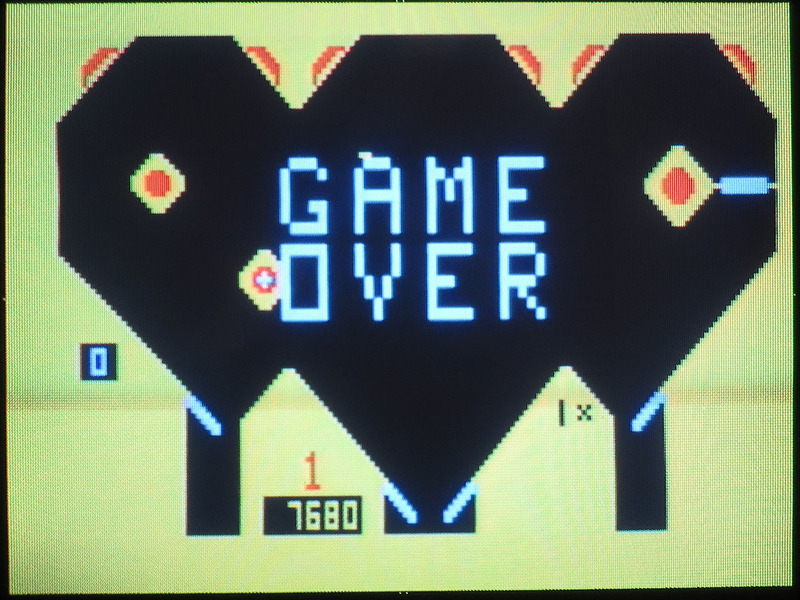 "Designer Bob Ogdon responded to the challenge with a dual-playfield masterpiece that captures all the sights, sounds, and spirit of genuine flipper-game play. Using a pair of the Professional Arcade's excellent pistol-grip command units, players can effectively control left- and right-side flippers individually. Both of the electronic tables use the same flipper arrangement. Each has a pair of bats at the center of the bottom of the screen, with single flippers guarding two extra drains located along the lower edge of the field to the left and right of the central pair. "The trimmings should be familiar to those who occasionally forsake the delights of Pac-Man and Defender for coin-op pinball machines. The highlights include back bumpers, thumper bumpers, drop targets, a spinner, and virtually everything else you'd expect except a flashing back-plate. 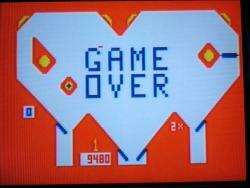 "Orchestrating ball movement is perhaps the hardest part of pinball to translate to the video screen. Bill Budge, who created the best-selling Apple II program Raster Blaster, worked out the ball dynamics mathematically, determining the effect of gravity and other physical laws on the trajectory of a wildly bouncing metal sphere. Bob Ogdon has done virtually as well here, infusing his creation with a feeling of realism that is generally absent in video pin contests. "Field number one in Bally Pin is a colorful explosion of white, red, and yellow. The second table is equally vibrant, though many will find its more soothing dark field easier on the eyes. Drop targets and bumpers are placed a little differently in each version, though they are the same overall. 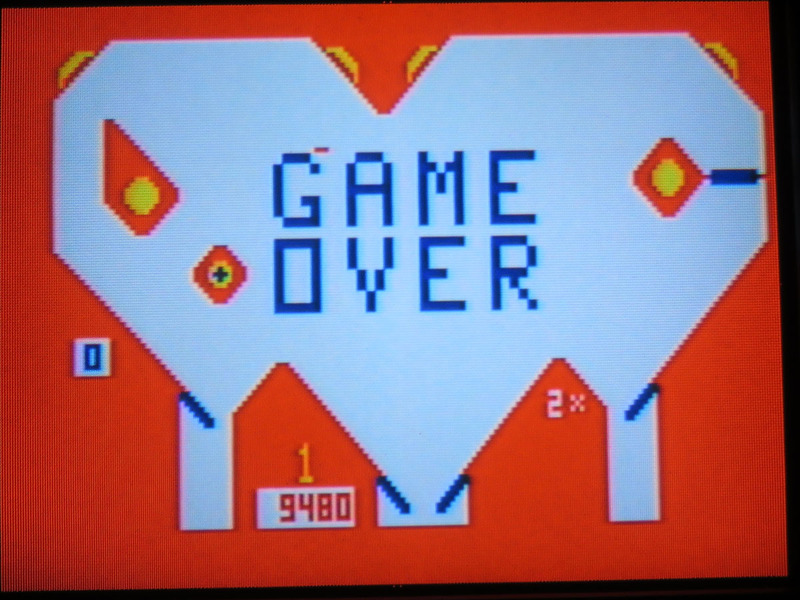 "Standard pinball strategy definitely applies, so gaining optimal control over flipper movement is the top priority. The flippers can be held in the up position indefinitely, permitting the arcader to trap the ball for a few seconds while deciding which part of the field should be its next destination. Having the player hold one controller in each hand is this game's most significant innovation. It provides a sensation unlike anything else in video-gaming while faithfully reproducing the necessary pinball ambience." Unlike many Bally games, Bally Pin has no play settings. As usual, 10 points can be earned this round (excluding bonus points). You can earn up to 5 points for playing the first table ("Bally Pin I") and 5 more points for playing the second table ("Bally Pin II"). 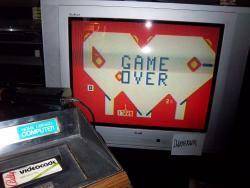 1) Bally Pin I - Beat 320,430 points - Don Gladden scored 320,430 points on "Bally Pin I" (ARCADIAN 6, no. 3 (Jan. 27, 1984): 23.) 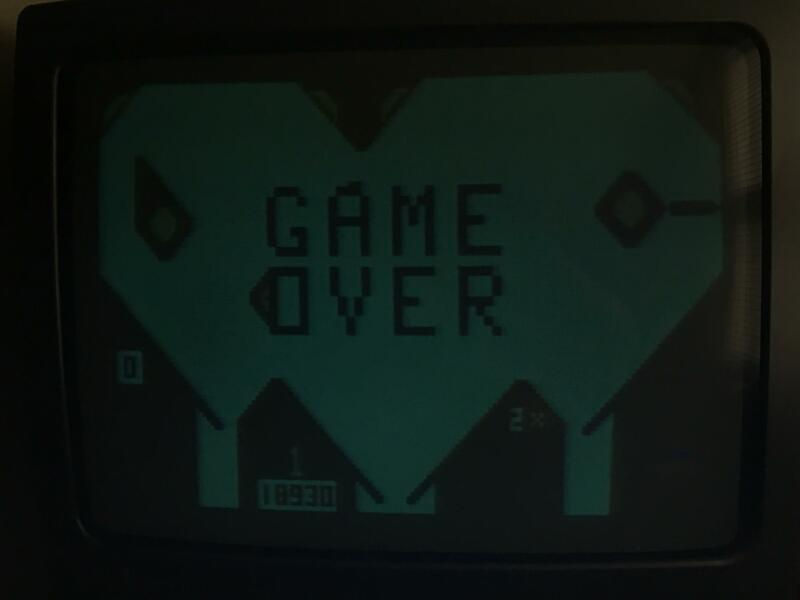 Beat Don's score. 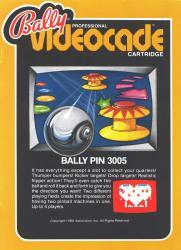 2) Bally Pin II - Beat 336,700 points - Stan Kendall scored 336,700 points on "Bally Pin II" (ARCADIAN 6, no. 2 (Dec. 22, 1983): 14.) Beat Stan's score. Paul did such a great job choosing Candy Man for the last round (that was fun game!). I figured it was worth asking him privately for a suggestion for this round's BASIC bonus game. He replied to me by saying, "Avalanche! by Steve Walters came to mind. It's kind of like a strategy Pachinko game--pretty unique. I don't have time to try it again tonight, but maybe it will suit you." Well, I tried the game this evening. The game isn't fast (it's not meant to be), but it seems to provide what I like best about Bally BASIC programs: it is a game for the Astrocade that probably never would have been created if Steve Walters didn't (I surmise) have some interest in the game pachinko. 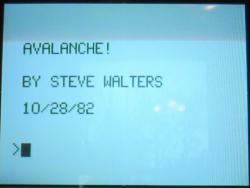 I don't quite get the scoring in Avalanche!... but we'll work it out during the round (I hope). There are some very brief instructions for the game from an ad in Summer 1982 Sourcebook: "Avalanche! - Try to drop a ball in the top without making any balls fall past the levers to the bottom. After a few turns, someone will cause an avalanche! For 1 to 4 players." 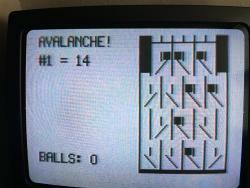 1) Playing Avalanche! 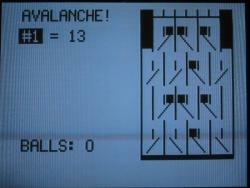 - You get a bonus point just for playing Avalanche! 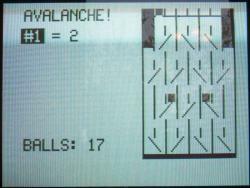 2) Avalanche! 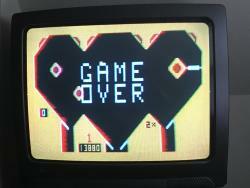 High Score - You can earn another bonus point if you get the highest score for this game. 3) Video of Avalanche! - To continue to promote Astrocade BASIC programs, a bonus point will be awarded to the first person to upload a video of Avalanche! containing a full game, plus the game's loading screen. 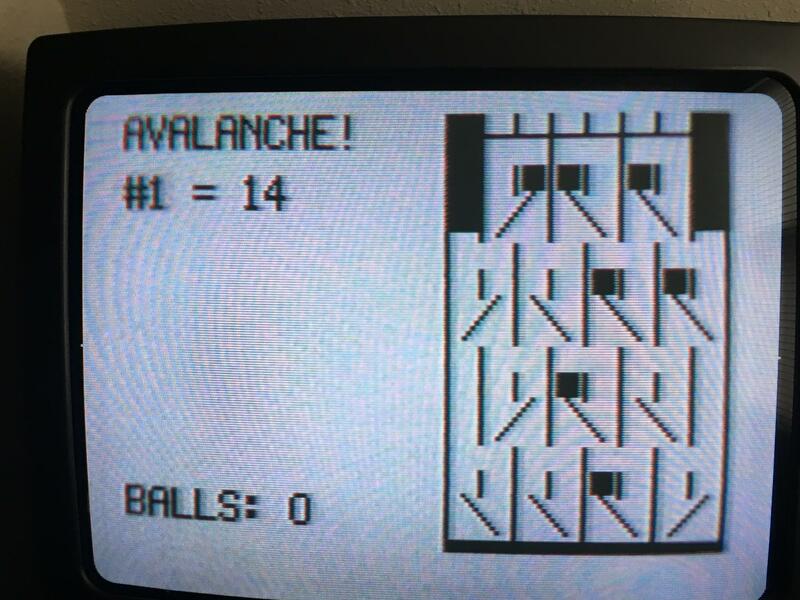 4) Avalanche! Play Instructions - The person who explains how the rules for this game work will receive a bonus point. This is a competition of sorts. If more than one person explains the rules, then the winner will be whoever writes the rules up best (in my opinion). Sorry that I don't have more information to provide for Avalanche! (hopefully someone can help out here). 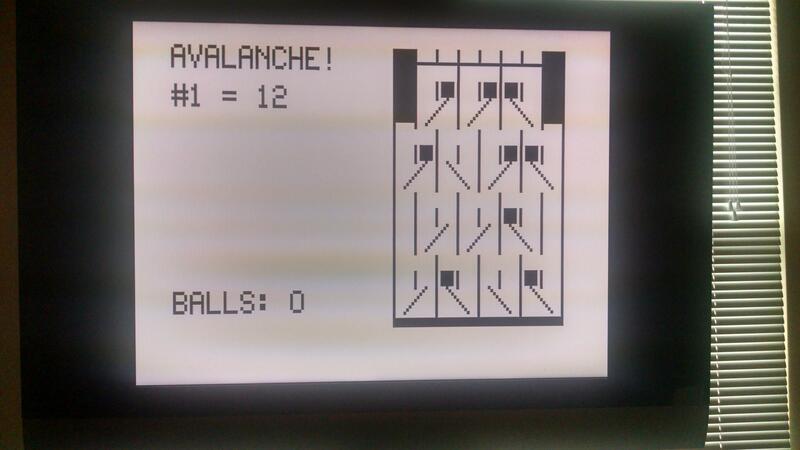 Enjoy playing Bally Pin and discovering Avalanche! 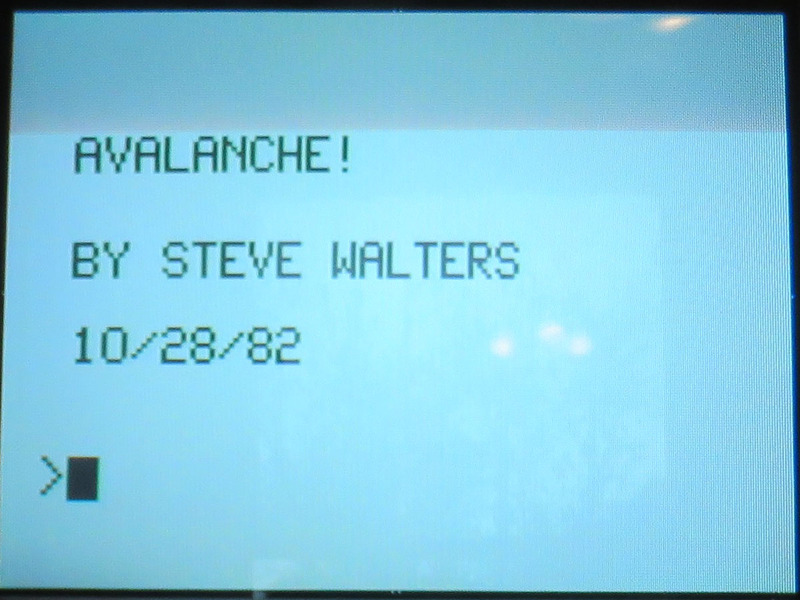 Chris and I played Avalanche! last night. I was hoping that Chris might be able to figure-out how to play it and explain it to me. Points are awarded for every ball that makes it to the bottom of the screen. 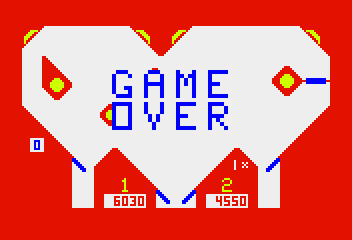 If the goal of the game is the keep as many of the balls from falling through to the bottom (which the fragment of gameplay mechanics gleaned from the ad seems to imply), then perhaps the goal is to achieve the lowest score (rather than the highest score). Any thoughts on this? 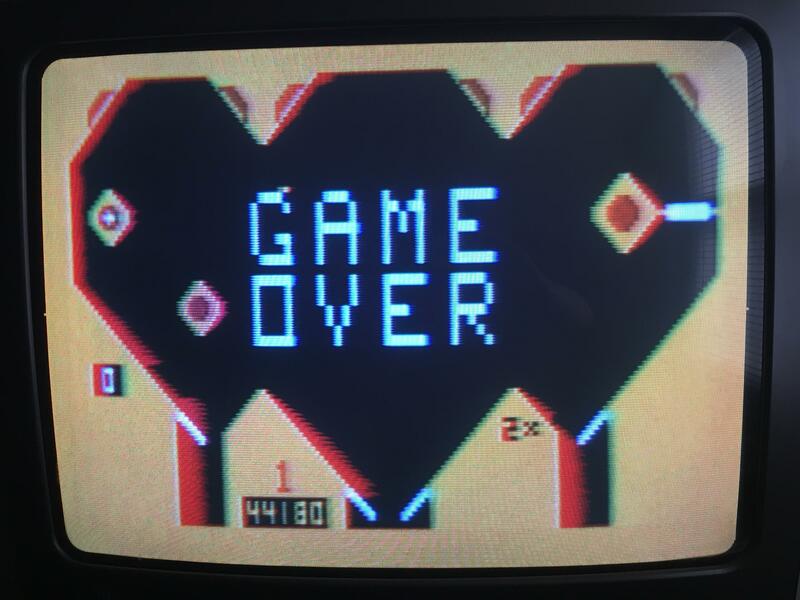 "1-4 players drop blocks through a system of levers. Depending on the positions of the levers, the blocks will either get stuck or fall to the bottom. After a set number of turns, the player who let the fewest number of blocks fall to the bottom wins. This program is very similar to Hang Up!" "Hang Up!" is an interesting variation, which I'm not sure was ever officially published. "2-4 players drop blocks through a system of levers. Depending on the positions of the levers, the blocks will either get stuck or fall to the bottom. Each player begins with a limited supply of blocks. A player loses a block by dropping it during a turn, and gains any blocks that fall to the bottom. The first player to run out of blocks wins. This program is very similar to Avalanche!" I'm going to try playing it again this weekend. Yes, I definitely interpreted it as lowest score wins. Thanks for clearing that up, Paul. You get the bonus point documenting the rules. "Avalanche!" 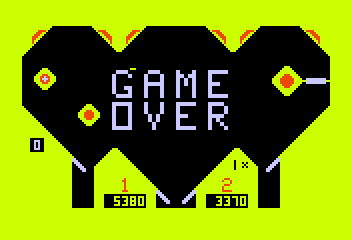 (Steve Walters, 1982) looks like a Pachinko game, but rather than a fast-paced, luck-based game of Pachinko, it's actually a turn-based strategic game. The playfield has six slots on the top to drop balls into. The field then widens to eight channels. As you go down the field, you run into a series of levers--three on the top level, then four, three, and four again. Each lever will always be tilted diagonally such that the top of the lever will be either on the left or the right. There are walls between the levers with gaps that let balls switch between channels in certain circumstances. I'll describe a single-player game here. When the game starts, four balls automatically drop onto the field. The player then has 17 balls which they can always drop into any of the six slots. So, what does a ball do when you drop it? This is entirely predictable based upon the position of the balls and levers. A ball will drop straight down until it encounters an obstacle. If a ball hits the top of a lever, it stops there. If a ball hits the bottom of a lever, it flips the lever to the opposite position, and the ball keeps falling. If a ball hits another ball, it slides to the other side of the lever and keeps falling. Next, it will hit the bottom of the lever and flip the lever. This means the ball that was originally stuck there will start falling, and hit the lever again. Ultimately, both balls fall, and the lever ends up in the same position it started in. You "score" whenever a ball falls to the very bottom and leaves the field. But the goal of the game is to prevent this. Like golf, you want as low a score as possible. You have to drop all 17 of your balls, so at the end, you want as many as possible to be stuck on the top of a lever. There are 21 balls in play (your 17, plus the 4 dropped initially), but only 14 levers, so you can't keep every ball up. In this example, I ended the game with 9 balls on the levers, for a score of 12 (9 balls saved + 12 balls dropped = 21 balls total). Perhaps you can do better. Is it possible to end the game with a ball on all 14 levers, for a score of 7? "Avalanche!" 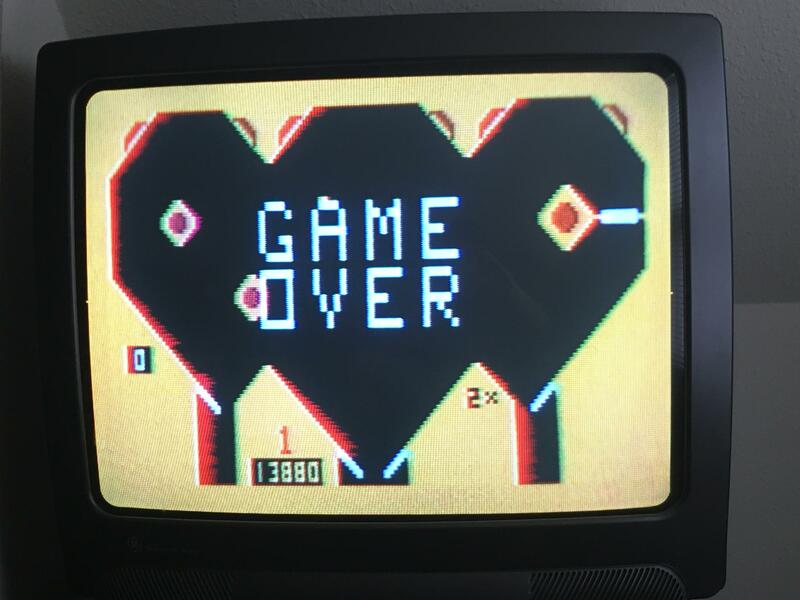 (Steve Walters, 1982) looks like a Pachinko game, but rather than a fast-paced, luck-based game of Pachinko, it's actually a turn-based strategic game. Great instructions, Paul! This week, I'll place them into the AstroBASIC archive of the game. 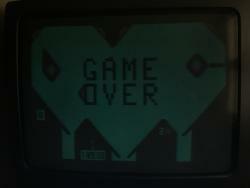 The next time that I play the game, I'm going to take a snapshot of the screen before play begins. I want to see if the game begins with the levers in a random position, because if it doesn't start out random, then every game could be played with the same moves, which would yield the the same end-result. When Chris played the other night, he ended up with a score of 9-- but we didn't take a picture (I guess we should have done that). I hope other people trying playing this bonus game, as I've not played a game quite like this one before on any system. I played Bally Pin and Avalanche for a solid hour. The pinball game is hard. Avalanche! is slow-- but quite fun-- and well worth a look if you haven't tried it before (which, I presume, most people haven't). I only managed to get double points once on Pinball I (I never did it in Pinball II). 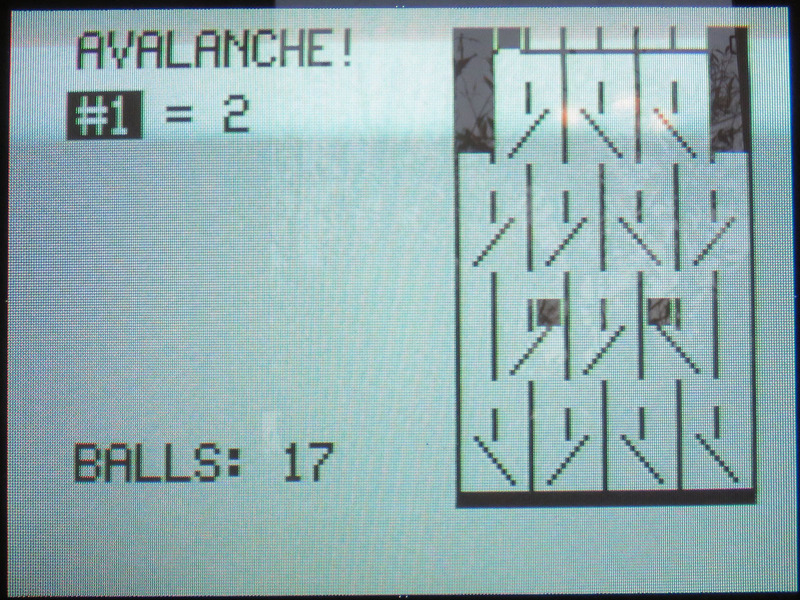 I'm trying to figure-out a winning strategy to Avalanche!, as I keep losing in the end with a terrible avalanche on balls falling through the bottom. Maybe I should let the balls fall through at the beginning of a game? Pinball is much harder than I expected, and I really miss a tilt function! 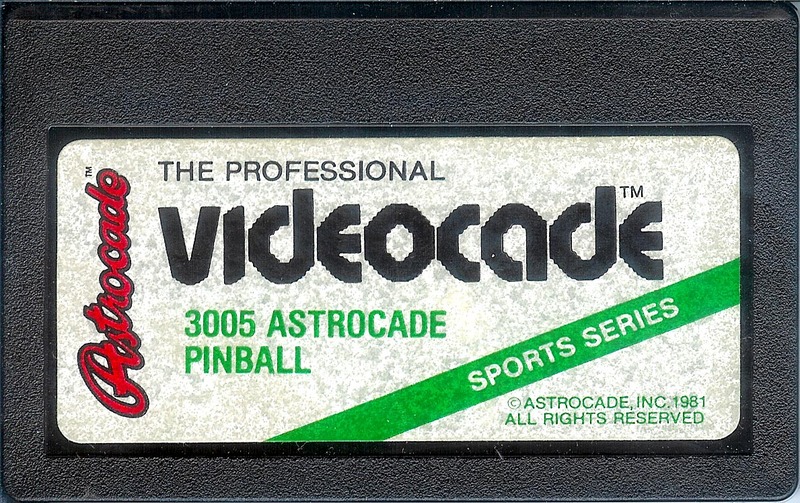 I can't imagine scoring hundreds of thousands of points in this game! 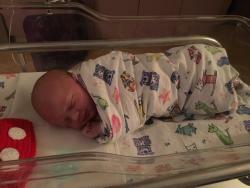 Wife induced today!!! Please accept photos later! 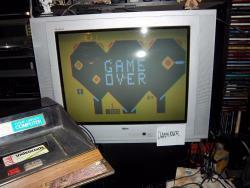 Bally 1 8200, 2 was 13880, I am terrible at Avalanche it was 14. Yeah, Pinball is pretty tricky. Too bad there's no tilt function! I know this is late for the competition, but I tried again and obliterated my scores. I was out of town for a week, so I'm behind. You may as well take advantage of that, right (i.e. your scores count-- yeah!)? I'll try to post the final results for this round today. I'm not sure what the next game is going to be yet. Round 7 was meant to officially end May 22, 2016. Since I was out of town, a couple of late entries have been accepted. 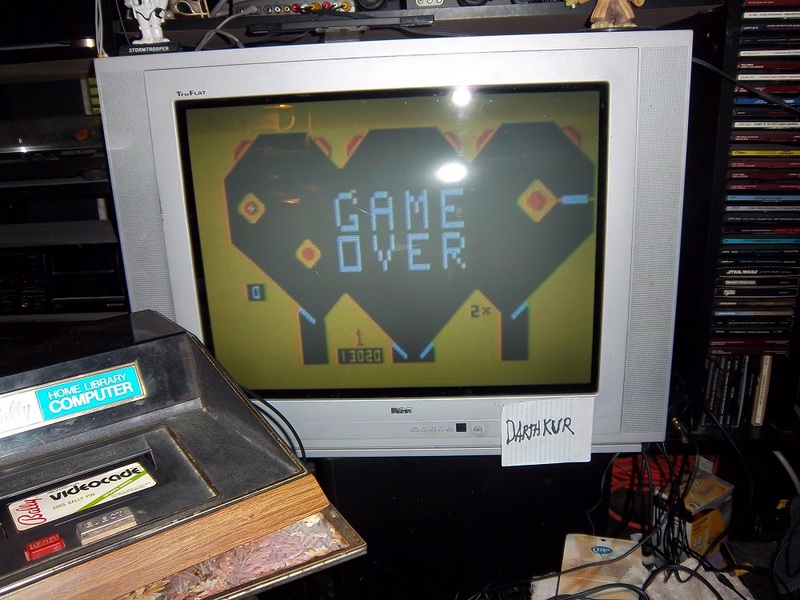 There were five qualifying entries for the high score contest. Every player who played the BASIC bonus game gets a point. 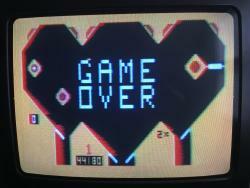 Chris++ earned an extra point for scoring the lowest on this interesting BASIC bonus game. Congratulations to Round 7's winner, nd2003grad! 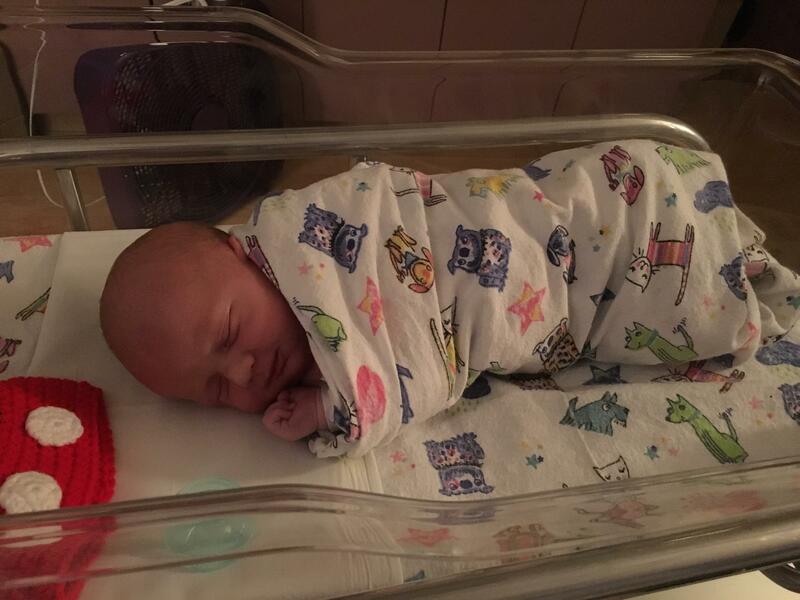 nd2003grad gets a double-plus high five this round for having somehow managed to beat us all even while his new child arrived this week. We Bally players ought to be ashamed of ourselves! Good luck to the newest Bally player in the world! Before you know it, this kid will be beating all of our scores! 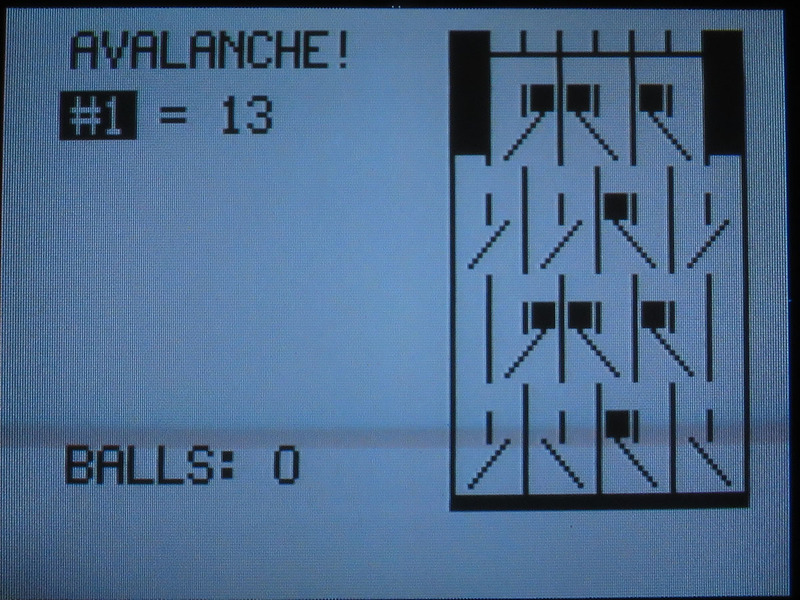 Also, thanks to Paul for creating the instructions for Avalanche! In the the next round, we're going to play a third-party game by Spectrecade called Treasure Cove. This one has rather top-notch graphics. 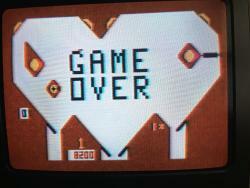 It includes a great title screen with music. Plus... it's fun! The official start of Round 8 will be announced tomorrow, but feel free to splash and swim around while playing a few games of Treasure Cove. Thank you for your hearty congrats! Theodore says thank you!